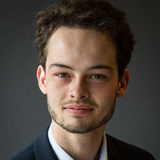 Rinke Hendriksen is following the blockchain industry for almost 5 years and has collected a significant amount of experience and knowledge since then. Rinke has a formal background in economy and finance and taught himself the basics of web-development. Rinke is specialized as smart-contract developer, with a certification as Ethereum smart-contract developer and hands-on experience as blockchain developer and consultant at AXVECO. Besides this, he is finishing his MSc. in Digital Currencies and building on a decentralized autonomous organization.